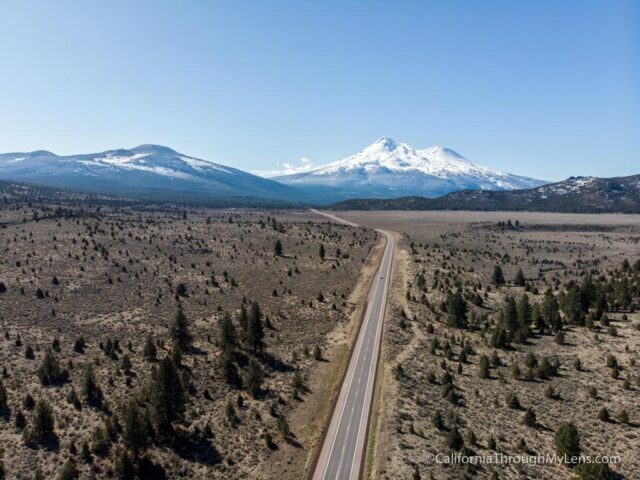 Siskiyou County is located in northern California, from the town of Dunsmuir all the way up to the Oregon border, and there are a ton of places to explore in the area. 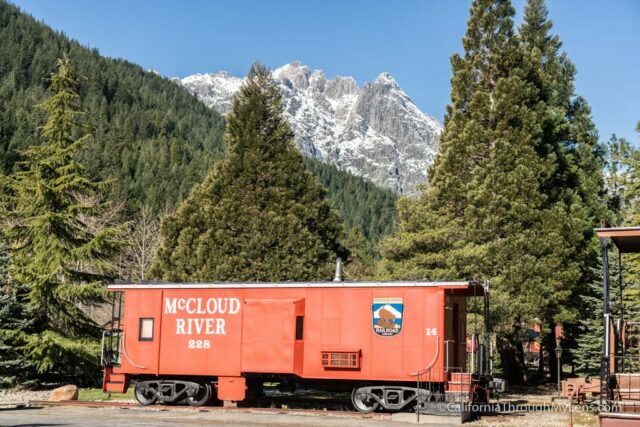 Everything from hikes and waterfalls to restaurants and trains can be seen along this stretch of Highway 5. While I have not done all that there is to do there, I have seen a lot, and here are 15 of my favorite spots. Mt. 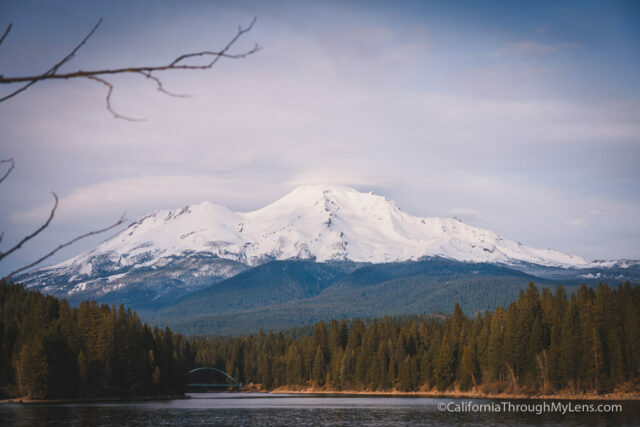 Shasta is one of the most popular attractions in Siskiyou County, and it’s one of the tallest mountains in the state of California. If you’re an advanced mountaineer you can climb it, but it is very difficult, so for most people they’ll just view it from afar. There’s lots of great places to view this mountain when you’re in the area, especially if the weather’s clear. 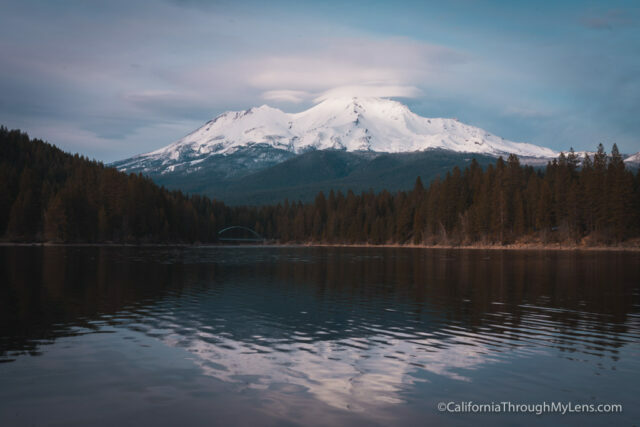 Some of my favorites are along Highway 97, which has a road leading to the mountain type shot, or from Lake Siskiyou, where you can get some of those cool reflection shots of the mountain. Pretty much anywhere around the Mt. Shasta area, you can see the mountain really well. 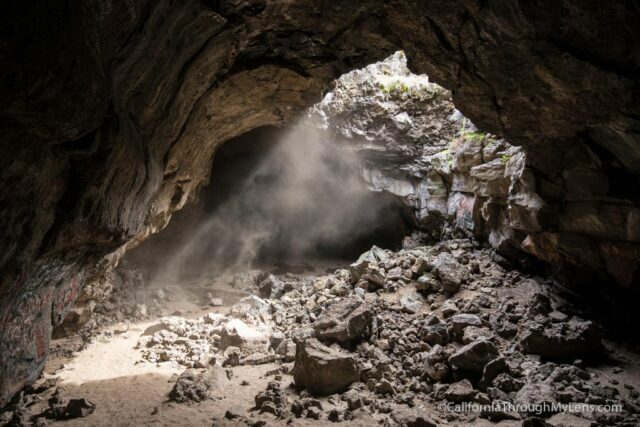 Lava Beds National Monument is a collection of over 800 lava tubes, over 20 of which you can explore yourself. It’s a large park, and each cave is unique. Here are a few of my favorites. Skull Cave has a huge opening in it, which is fun for pictures; and as you go in deeper, it gets really dark. My second favorite is Golden Dome, which has some really unique yellow tones throughout the ceiling. My third favorite is Sunshine Cave, which has a few cave-ins that let the sun in, and it’s a really cool place to explore. 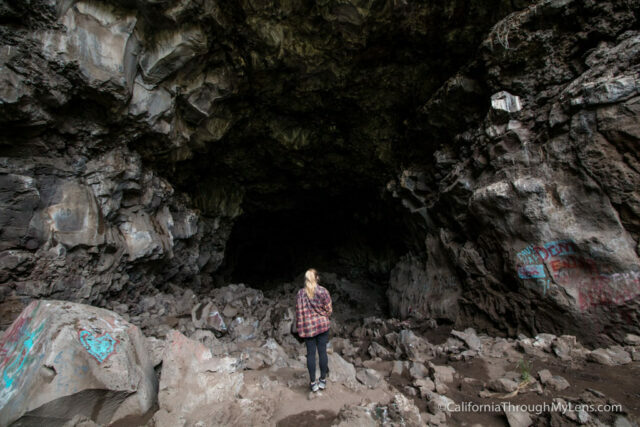 Read about more spots in Lava Tubes National Monument here. 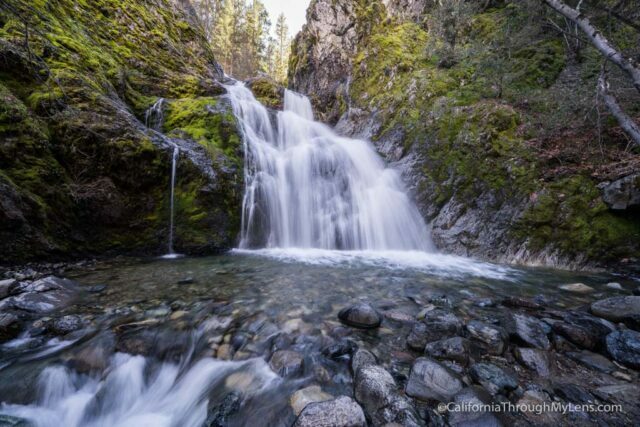 Hedge Creek Falls is located in the town of Dunsmuir, and it’s a short 5-minute hike to get to an awesome waterfall. It’s one of the few waterfalls that you can walk down to and actually walk behind it to go to the other side of the falls itself. Plus, it’s a great place for photography, and it’s not even usually that busy. Read more about Hedge Creek Falls here. Railroad Park Resort has a collection of railcars that you actually can stay the night in. Each car has some unique features, such as claw foot tubs and even little places that you can climb up into and look out from the car. There’s even a pool, an old steam engine that you can climb up in, and a railcar that you can even have a meal in. All of this is located in the shadow of the awesome Castle Crags. Read more about Railroad Park Resort here. 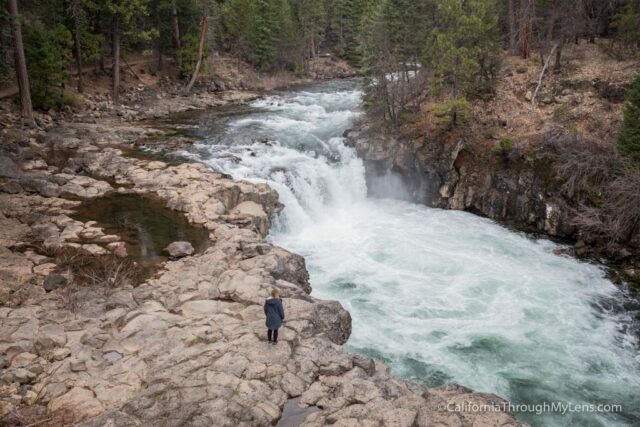 McCloud Falls is a collection of three different waterfalls south of Mt. Shasta in the town of McCloud. 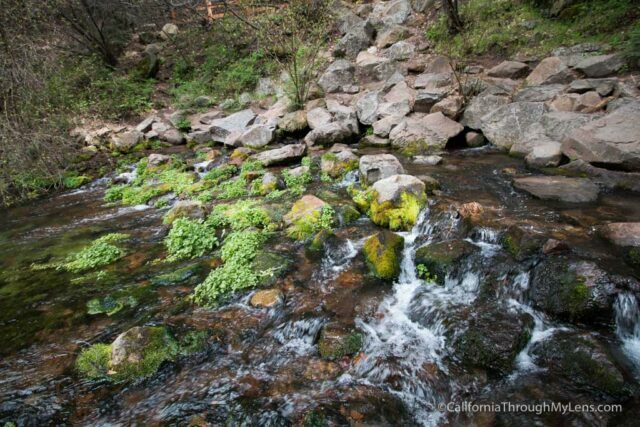 You can drive to all three tiers of the waterfall, or you can do a 2- to 3-mile hike to get to each one. Each waterfall is unique, with Lower Falls being one of the easiest to access. You’re actually right near the waterfall when you get out of your car. At Middle Falls, you have to walk to an overlook and you look way down on the waterfall (or you can hike down to it if you have the time). Lastly, Upper Falls is another short walk to an impressive waterfall that’s in between two big rock formations. Read more about McCloud Falls here. 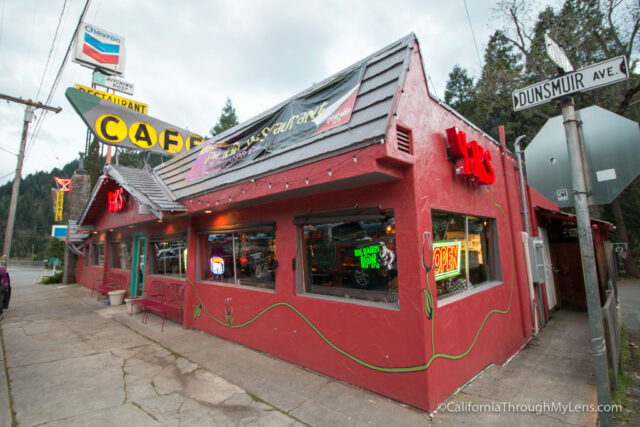 Yaks on the 5 is one of the most popular stops on Highway 5 and has even been featured on Yelp’s Top 100 list. They have a wide collection of crazy and fun hamburgers, such as one that has two sticky buns instead of the traditional hamburger buns. They make a lot of their sauces in-house, including lavender ketchup, and they also have an extensive beer list to go with your burger. Read more about Yaks on the 5 here. 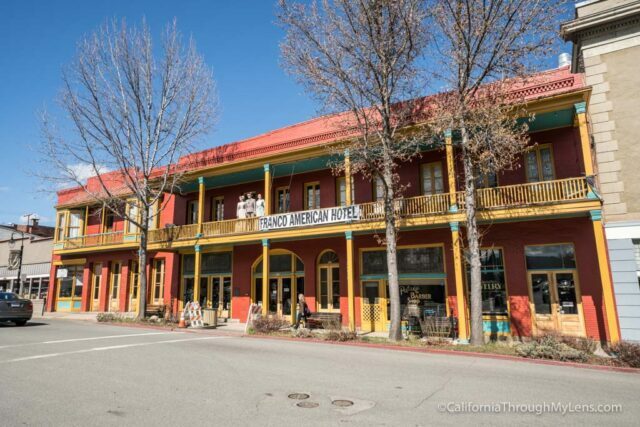 Yreka is one of the largest towns in Siskiyou County and has a lot of historic Gold Rush era buildings and businesses. One of my favorite stops there is Zephyr Books & Coffee, which is a fun coffee shop right on the main downtown street. There’s also some great restaurants, an old barber shop, an old hotel, antique stores – lots of fun things to walk around and see. 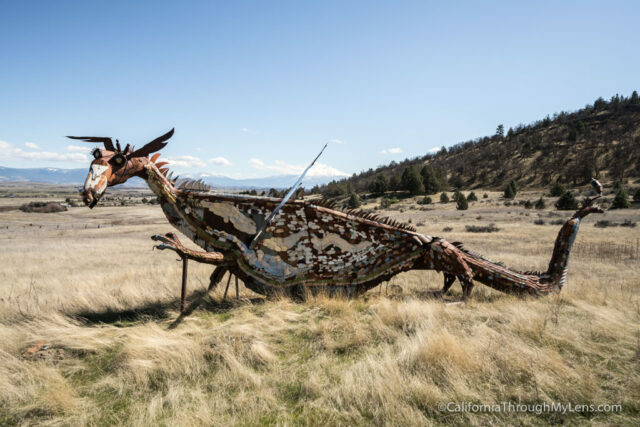 Then, when you exit the town, be sure to stop at the Yreka Dragon, which is located about 4 miles up on Highway 5, right on the side of the road. There’s a little pullout there, and you can walk out and take some pictures of it. It’s a popular roadside attraction in the Yreka area. Mt. 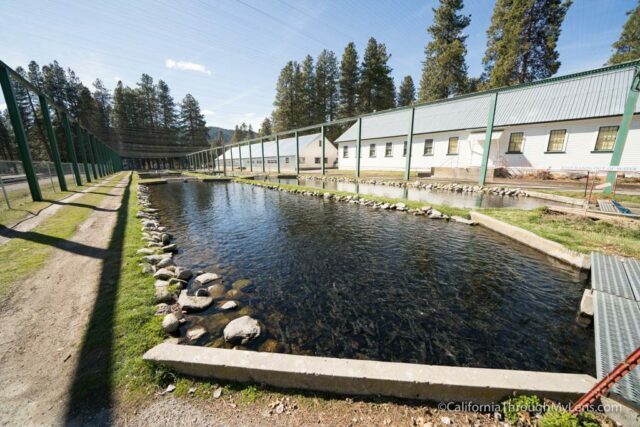 Shasta Fish Hatchery opened in 1888 and is the oldest trout fish hatchery west of the Mississippi. The hatchery is open to the public daily, and you can even grab some fish food, feed the fish, and walk around. It’s a great place to spend about 30 minutes, especially if you have children, because the fish are super excited to eat the food. Living Memorial Sculpture Garden located about 12 miles east of the town of Weed on Highway 97, is dedicated to all veterans who have served in any of our country’s wars. The sculptures were created to honor everyone from the nurses that served during the wars, to the POWs, to those that were missing in action. One of my favorite sculptures is called Coming Home, and it shows the embrace of two people celebrating being reunited after a war. It’s a great area to spend 30-45 minutes just looking around at all the really detailed sculptures. 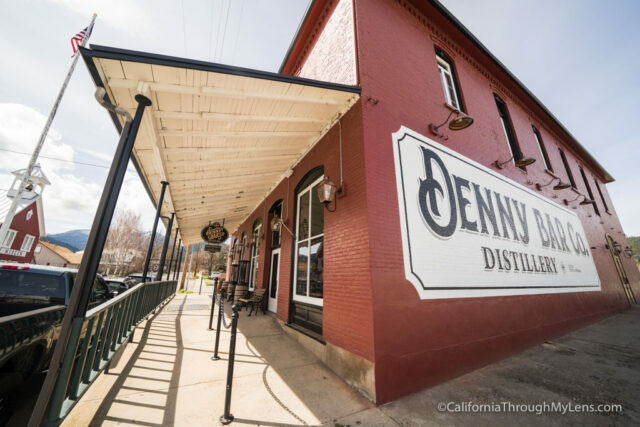 Denny Bar Co. Distillery is located about 45 minutes off the highway in the small town of Etna. It’s a cool, modern restaurant that you would not expect to find in such a small town. It has an eclectic menu with fun options such as pizza and some of the best avocado toast I have ever had. Often on the weekends you can take a tour of their distillery and try their gin and vodka. 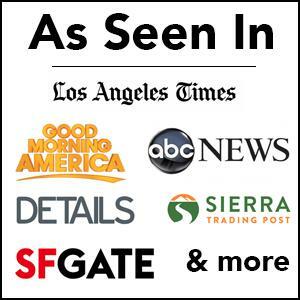 All of this is located in a 100-year-old bank building that has been extraordinarily well-preserved. 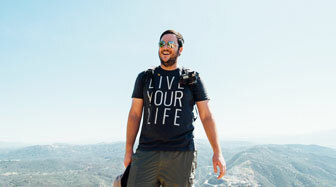 It is easily worth the 45-minute drive off the freeway to get there. On the way back to the highway be sure to stop at California Heritage Farms in Fort Jones. 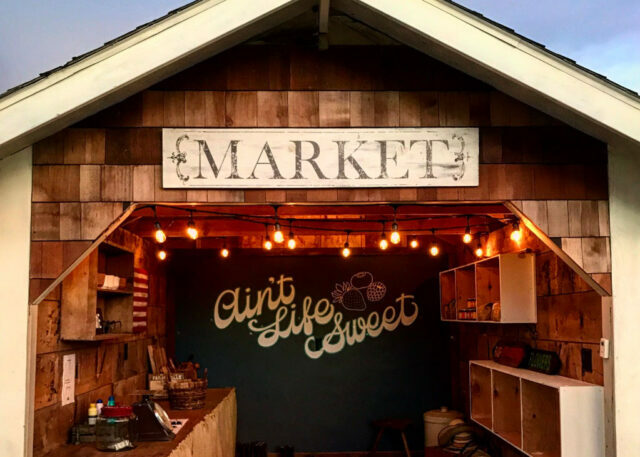 They sell regional goods and fresh fruit (June – October), plus during the summer you can pick your own berries from their patch! Lake Siskiyou is a large body of water on the west side of Mt. Shasta that’s a favorite summer destination, but that’s excellent year-round for photography. They have a trail that goes around the entire lake. I love just pulling off and walking along the shores, trying to capture great views of Mt. Shasta reflecting in the water. During the summer you can also get out on the water and do some kayaking. It’s a great spot to have so close to the town of Mt. Shasta. 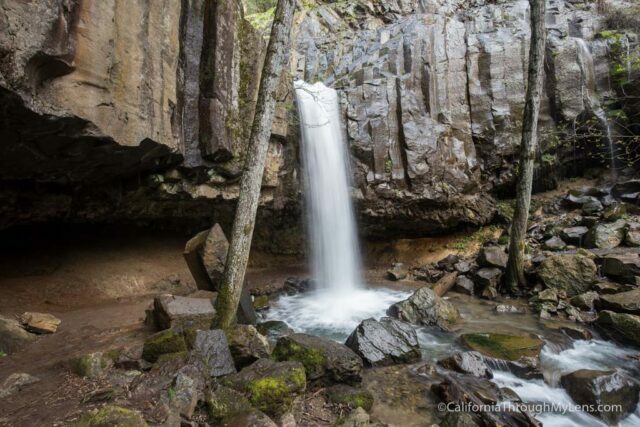 Faery Falls is a 1.5-mile roundtrip hike to a beautiful 40-foot waterfall. Along the walk you’ll pass by ruins of an old health resort, and you follow the creek pretty much the entire time. As you get closer to the falls, you’ll see a short spur that’ll take you down to the base of the waterfall to take some great pictures. It’s a great hike in Siskiyou County, but make sure you get directions online to the trailhead, as it can be kind of hard to find. Read more about Faery Falls here. The Tulelake Segregation Center is located about 2 hours from the town of Mt. Shasta, so it’s way in the northern part of California. 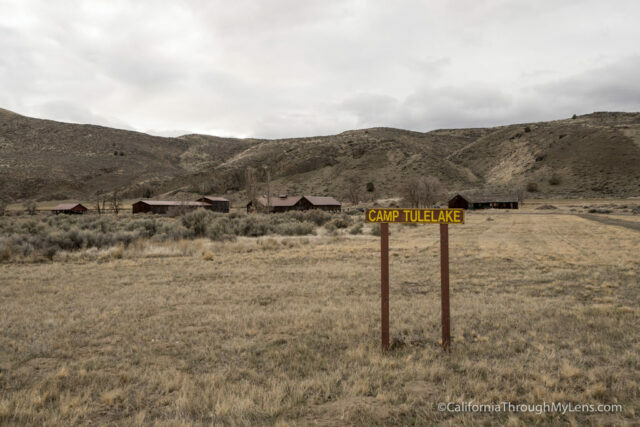 This area is run by the National Parks Service, and much like Manzanar on Highway 395, it focuses on the relocation of Japanese Americans during World War II. 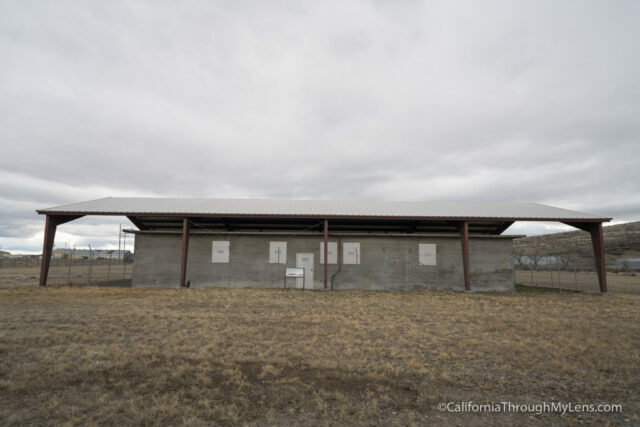 This sad part of California’s history once housed over 18,000 people, and you can take a tour and see the segregation center and Camp Tulelake during the summer. On the tour, they’ll guide you through the old jail, which is one of the only remaining buildings at the segregation center. Then you drive about 8 miles across town to Camp Tulelake, which has a lot of old buildings and some plaques with information on the area that you can still walk around and see. This pretty little spring ends up being the most significant river in California, stretching over 400 miles south all the way to the San Joaquin Delta. Some people believe that this water has healing properties, but I wouldn’t recommend drinking from it. 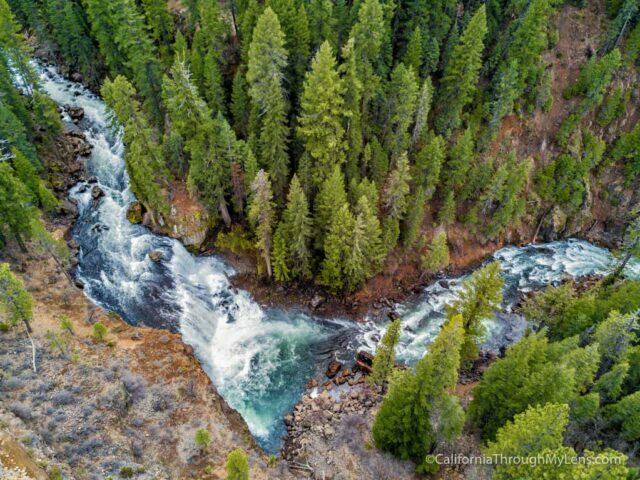 It’s just fun to see where this massive river starts from at the Sacramento River Headwaters. 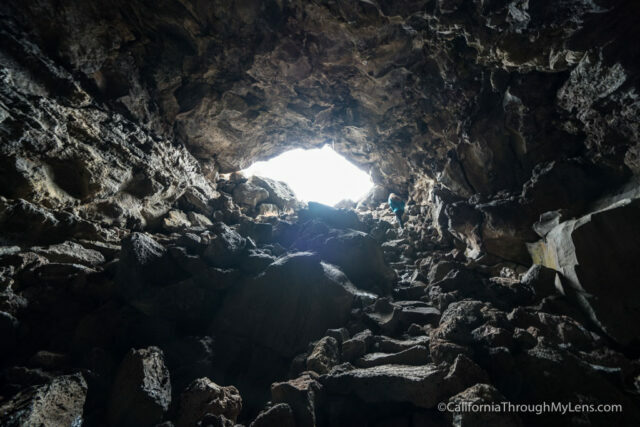 Pluto’s Cave is about 12 miles outside the town of Weed, California, and if you can’t make it all the way up to Lava Tubes National Monument, this is a great way to get some cave exploring in the county. Be sure to get directions online, as it can be a little bit hard to figure out where to turn to get to the start of the Pluto’s Cave hike. 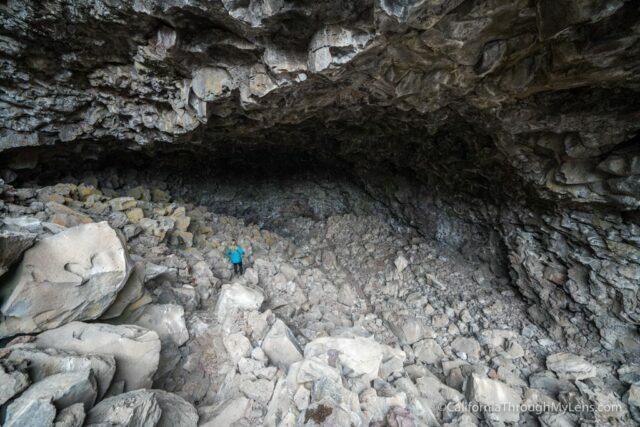 Once you do the short half-mile hike to get to the entrance of the cave, you can walk down into it, go through multiple sections and see an awesome cave-in that lets the light in. It’s great for photography. There are multiple tiers to explore in this cave, so be sure you grab a flashlight and that you’re okay with being in the dark. Read more about Pluto’s Cave here. Here is a video I made of all the spots as well. 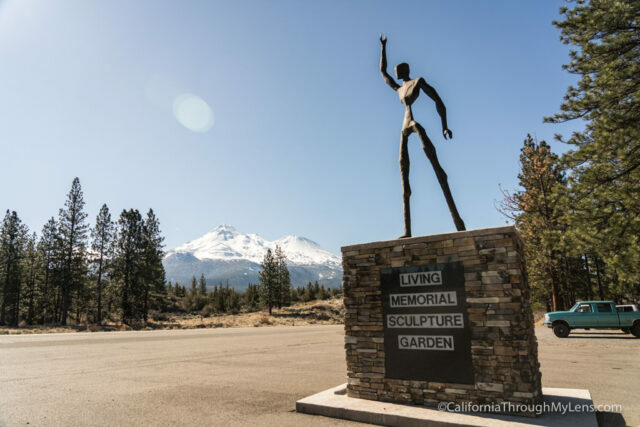 So that’s it, my 15 favorite spots to explore in Siskiyou County. Let me know what I left off in the comments, and be sure to get up to this area and check these spots out for yourself. You can also find more places to explore at DiscoverSiskiyou.com.